BENGALI: Acha-kamsen, Krom dung pow, Krom be, Rixom payo. CHINESE: Shui zhen zhu cai. INDONESIAN: Ke kucing (Aceh), Ketumpang (Javanese), Kambing kambing (Kalimantan). VIETNAMESE: T[us] h[uf]ng h[if]nh tai, c[or] c[of]. Buntot pusa is an annual, hairy herb, 30 to 60 centimeters in height. Leaves are oblong, 2.5 to 7.5 centimeters long, stalkless or short-stalked, and acute of blunt at the tip. Flowers are small, borne in whorls or hairy spikes. Calyx is very small, 5 to 7 millimeters long, with triangular teeth; enlarging to a fruit. Corolla is usually pink, with a slender tube and hairy lobes. Nutlets are ellipsoid and smooth. - Abundant in open, wet places at low and medium altitudes from northern Luzon to Palawan and Mindanao. - Also occurs in India to southern China and Malaya. - Aerial parts of P. auricularius yielded 4 cleistanthane type diterpenoids (C20), one of which is auricularic acid. Compounds shown to exhibit spasmolytic activity. - Considered diuretic, antipyretic, antihelmintic, antidiarrheal, spasmolytic, and anti-cancer. Leaves, leaf juice, whole plant. - Used in children, for simple stomach problems as pains and flatulence. The plant is pounded, alone or poulticed with lime, and applied to the abdomen. - Poultice is also used for parasitism, kidney ailments, sore throat, headache, stomach pains and diarrhea. - Malays used the plant for treating simple disturbances of the stomach in children. - In Java, leaves reportedly used for stomach problems. - In Bangladesh, used for stomach pains as warm leaf poultice; and as leaf juice in tetanus, as blood purifier, and for helminthiasis. Leaf juice used as eye drops in hysteria. Plant extract given with salt for diarrhea. - Leaf juice used as eye drops in hysteria. - In Bangladesh, extract given with salt in diarrhea by the Marma in Bandarban. 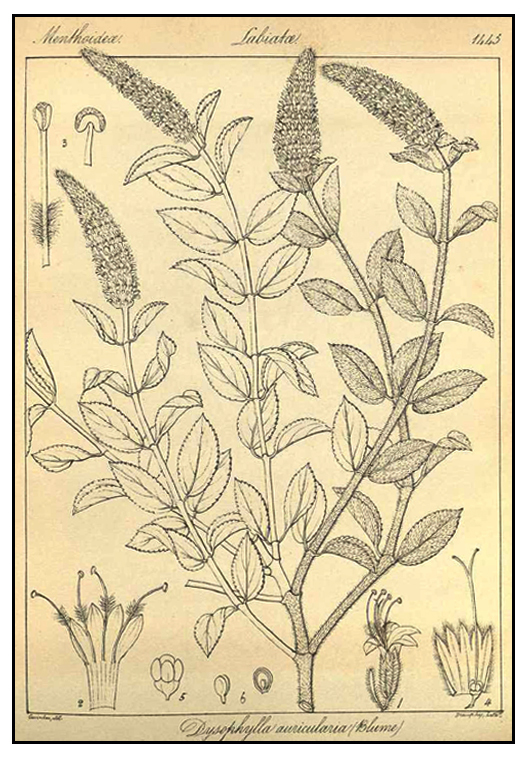 Pogostemon auricularius (L.) Hassk. / Retnowati, E., 2001. Pogostemon auricularius (L.) Hassk. [Internet] Record from Proseabase. van Valkenburg, J.L.C.H. and Bunyapraphatsara, N. (Editors). / PROSEA (Plant Resources of South-East Asia) Foundation, Bogor, Indonesia. http://www.proseanet.org. Spasmolytic diterpenes from pogostemon auricularis. / Agarwal S.; Hussaini F.A. ; Prakash O.; Roy R.; Shoeb A. / Indian Journal Of Chemistry Section B Organic Chemistry Including Medicinal Chemistry. 29(2): 184-186,1990.